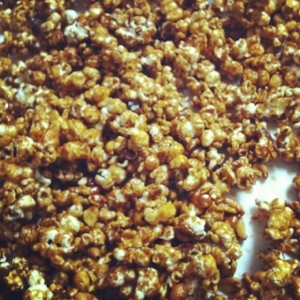 I made some really tasty caramel corn. At least this time I did not burn the caramel sauce getting it to the hard ball stage. Making candy can be tricky. Unless you trust your candy thermometer 100 percent, I think it is best to check to see if candy is done by dropping a little bit in cold water.. I made caramel corn once and ruined a pan. Gotta watch that temp! Thanks for sharing at The Gathering Spot this week!